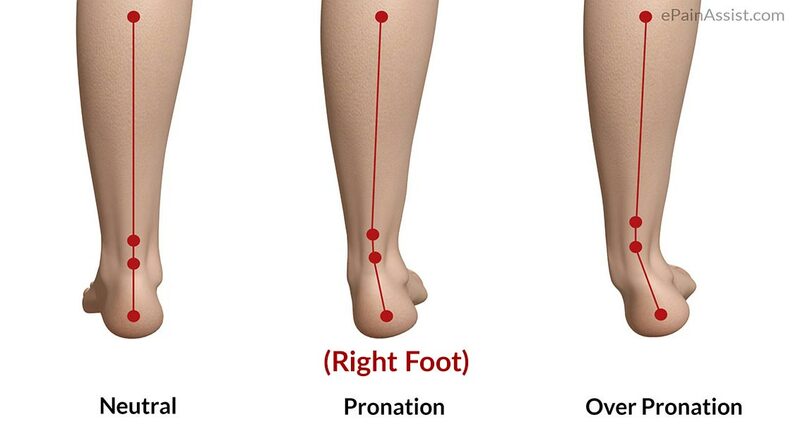 Do you suffer from over pronation? Over pronation is thought to be one of the most common causes of pain in runners, and is a topic we’ve referenced throughout our other posts on running. So, what is over pronation? Over pronation is excessive movement in your feet and ankles, where the arch flattens and the foot rolls inward when you run or walk (pictured below). People can naturally demonstrate varying amounts of pronation, and what is normal for one person may be the cause of pain in another. The reason people can experience pain due to over pronation is the amount of stress that it can place on the tissues of the inside of the ankle, lower leg, knee, or even hip. What can I do about over pronation? Typically, the best thing to do for over pronation is to make sure that you have appropriate footwear. This is where our friends at Varsity Sports can help. At Varsity Sports, they will look at your feet, watch you walk, and make a recommendation about the type of shoes you should be wearing. If your shoes are still not giving enough support, they also sell inserts that you can place inside your shoes to help put your foot in a more appropriate position. If you try these things and your pain persists, or if you would just like a formal assessment from a movement dysfunction professional, make an appointment with a physical therapist at one of our seven different locations. There may be other things you would benefit from such as strengthening exercises, hands-on manual therapy techniques, or custom orthotics made in-house to address YOUR specific needs. © 2019 Baton Rouge Physical Therapy Lake. All rights reserved.